great as prevention during a breakout of respiratory infections. 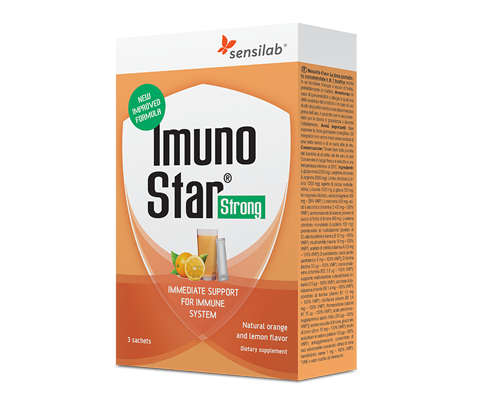 ImunoStar Strong is a unique product with 24 ingredients for the best immune response, that can immediately help you feel better. Amino acids boost and support our immune system. Vitamins C, B2, B6, and folate, as well as minerals zinc and selenium, contribute to the functioning of the immune system. Vitamin E contributes to the protection of cells from oxidative stress. Vitamin B6 contributes to the energy-yielding metabolism. Minerals magnesium and selenium, vitamins B6, C, and folate contribute to reducing tiredness and fatigue. Use: Recommended daily intake: 1 sachet, dissolved in a glass of water or juice after a meal. Active ingredients in 1 sachet: L-glutamine 2500 mg; L-arginine 2000 mg; L-lysine 1000 mg; L-taurine 1000 mg; L-glycine 700 mg; magnesium 105 mg – 28% NRV; L-methionine 500 mg; vitamin C 400 mg – 500% NRV; lemon fruit juice powder 400 mg; L-cysteine 100 mg; vitamin E 12 mg – 100% NRV; niacin 16 mg – 100% NRV; vitamin A 0.8 mg – 100% NRV; pantothenic acid 6 mg – 100% NRV; biotin 50 μg – 100% NRV; vitamin B12 2.5 μg – 100% NRV; vitamin D 5 μg – 100% NRV; vitamin B6 1.4 mg – 100% NRV; vitamin B1 1,1 mg – 100% NRV; vitamin B2 1.4 mg – 100% NRV; vitamin K1 75 μg – 100% NRV; folic acid 200 μg – 100% NRV; zinc 10 mg – 100% NRV; selenium 100 μg – 182% NRV; copper 1 mg – 100% NRV.